Kanaha from Tormod Happysurfer on Vimeo. To day super nice windsurf at uppers with my 4,7 and 81 L board. Keep up following, next post more Maui and windsurf. Nyra Alonso took some cool pixtures of the day. 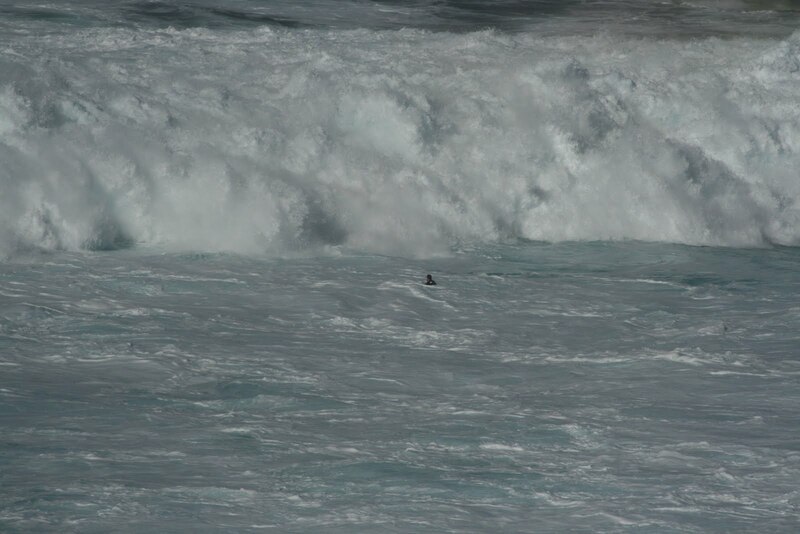 She catched a photo of the "skipping down the face of the wave on my back" Porcella is writing about. Look at Alonso's blog, even with a video from the day. About wipe out, I got a picture of one surfer in front of the white water..the picture speak for it selves...I dont know who the surfer is. It have been a long day. I have only time for some few words, but the pictures in the albums speak for themselves. To stand there at the cliff and look at the tow-in and the windsurfers is one of my biggest day in my life regarding a happening like a concert, an art exhibition, a Ibsen or Shakespeare play in the theater and so on. 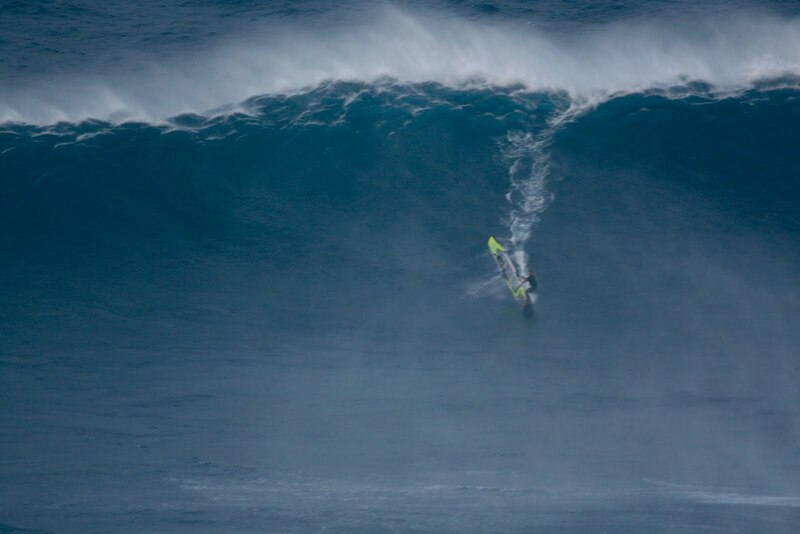 This surf and windsurfing at Jaws is some kind of art in my opinion. In its purity in communication with mother earth trough the big waves. It was so cool to see the tow-in surfers dynamic well synchronistic behavior. Ok enough of big words. About the pictures. It was a cind of difficult day with pictures. The day started with sun, but later it came a lot of rain and I had to put my camera away. And with the rein the wind arrived, so I don’t managed to take so many pictures of the windsurfers. The riders in the windsurf album of the name I know is Levi Siver, Francisco Porcella, Jason Polakow ..and some more I don’t remember the name on. Please mail me if I should add some names! The day started with a big expectation, we could almost feel the ground shake by the big waves hitting the reefs, there was jetskies in the water an a lot of helicopters buzzing around all over. Everybody had been taking about this day, And we had inside info from several pro windsurfers about when they was going to sail there. 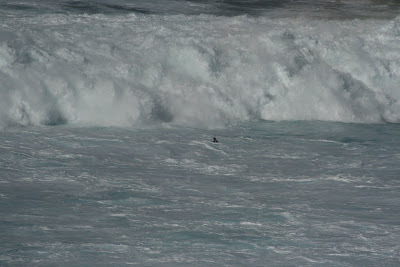 The peak of the swell was expected to be 20.00 o’clock so they tuned in to the session in the afternoon. A talked to Francisco Porcella the day before, and he was hoping for some pictures at Jaws, after the big arial pictures and photo video montage some weeks ago. :-) As I understood FP has done tow-in at Jaws before, but this was his first time on windsurfing board. I can not promise anything but maybe maybe I manage to have him as a guest writer on this blog about his experience of windsurfing jaws. I feel a bit stupid when writing this..a bit like a sports reporter…ref “what did you feel when you crossed the finish line as nr 1? Anyway I give it a try! “Edit ”: I am now happy to announce that we will get some cool words from Porcella about this day..keep up follow the blog..I will post his words probable tomorrow.